Brina Hostal. Your Cuban home. between your colorful explorations of Havana, Cuba. 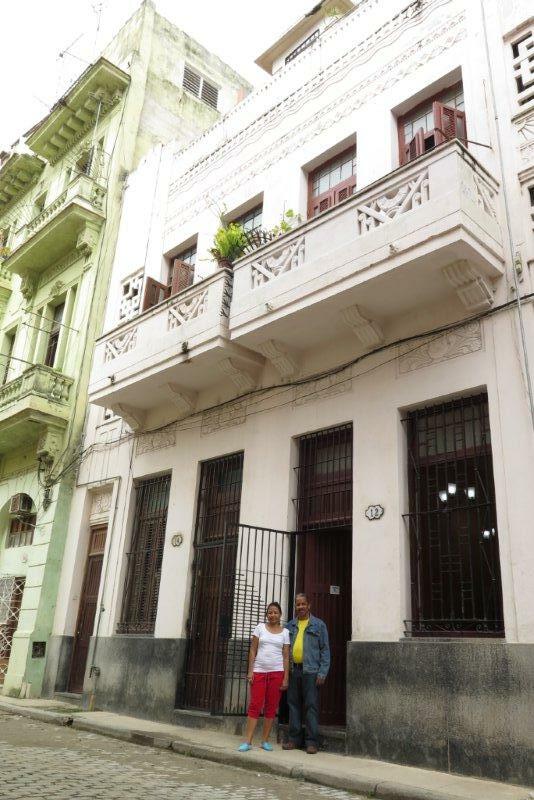 The house is a colonial house built in 1905, situated only 50 m from the Russian Orthodox Cathedral, in the picturesque Old Havana, in area which is calm by night, clean and safe. This is a perfect starting point to discover true Havana (click for the nearby sights). The house has three air conditioned rooms to welcome and accommodate guests. Ms. Leonor together with her parents Sergio and Miriam will happily prepare for you delicious breakfasts with coffee, milk, tea, fruit juice, bread, butter, cheese, eggs, salads, sweet potatoes, and a plate with three or four types of tropical fruit. Rooms with soap and towels. Kitchen that can be used at all times by the guests. Have a look at photos of the rooms! Hostal Brina is authorized by the state of the Republic of Cuba and has a valid license to operate. When looking for accomodation be careful to choose a house with this sign because it is the only legal type of tourist accomodation available in the Republic of Cuba. Entering the Republic of Cuba visitors must have designated address of their accomodation. You will have to show the address of your Cuban stay to Cuban border officials if asked.